GI Ducts & Ducting | Ventilation & HVAC | Apzem, India. Industrial ducting made of GI had very wide application across various industries specially HVAC industries. GI ducts in general manufactured as spiral ducts for round ducts application , and rectangular ducts. They are of lesser weight than MS ducts and is easy to install. Along with GI ducts we could also use FRP ducts, MS ducts, SS ducts, Aluminium ducts, Flexible ducts together forming complete ducting system tailored to your applications. Ducting should be properly designed considering all parameters otherwise friction losses and powder accumulation at short bends would become a continuous problems in long term. 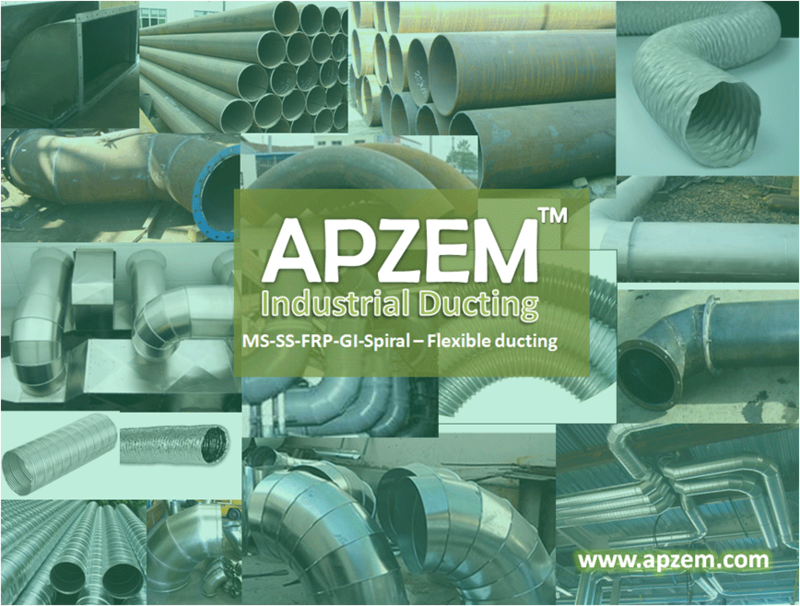 Apzem had a strong team of engineers having deep knowledge in various industrial processes, duct design, international ducting standards (SMACNA, AMCA etc..).We are happy to assist you in selecting, designing ducting for your process needs.